A mere 8 months ago, U2 tried unsuccessfully to bring their 2017 Joshua Tree Tour to St. Louis, Missouri. A rare occurrence for U2, the band was forced to cancel their concert after protests broke out in the city, when a white police officer was acquitted of murdering a black citizen. The large protests created a security crisis for the city, and the promoters made the difficult decision that they could not guarantee the safety of the band or concertgoers. It was a difficult day for St. Louis, for the country, and for the band and its fans. On Friday May 4th at the Scottrade Center, Bono, Edge, Adam and Larry more than made up for the unfortunate incident of last September, with an explosive 2 hour and 15 minute set for the second stop in their eXPERIENCE+iNNOCENCE Tour. Apologies accepted for the thousands of fans who were treated to a journey that included a blistering All Because of You (which sounds fresh, raw, and delightful in its return to the U2 repertoire), a mesmerizing The Ocean and the psychedelic acoustic surprise of Staring at the Sun from the underrated Pop album. The rendition of the latter focused on the theme of blindness, and the accompanying videos forced all of us to reckon with the division and ugliness that currently permeates through our society in 2018. 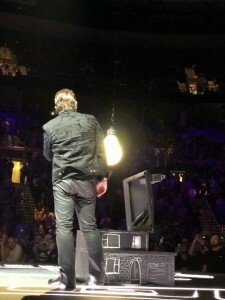 Some fans were disappointed that the band cut a few highlights from night one in Tulsa, Oklahoma, most notably the Achtung Baby deep cut Who’s Gonna Ride Your Wild Horses, but no one was complaining after a version of American Soul that is emerging as another live highlight in the band’s storied career. Setlists aside, the beauty of this tour thus far has been the elegance in which the themes of iNNOCENCE+eXPERIENCE interlock and overlap with eXPERIENCE+iNNOCENCE. Has there ever been a band in history that has created a two-tour narrative masterpiece where the connected parts complement each other in this way? Willie Williams and the band count on audiences having done their homework, as the tour relays the relationship between Songs of Innocence and Songs of Experience, with powerful messages of loss and light being conveyed. 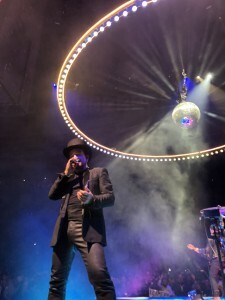 A vocal minority has complained about the lack of Joshua Tree songs, including a still hard to believe omission of Where the Streets Have No Name, but when past tours have been filled with such hits for decades, it’s hard to feel bad about these changes, especially when a fan favorite rarity like Acrobat emerges instead.